Posted on February 7, 2019 by gayle. 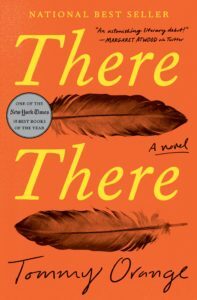 This entry was posted in 2019 EDIWTB Reading Challenge, Audiobooks, Fiction and tagged native americans, oakland, there there, tommy orange. Bookmark the permalink. Thanks for the thoughtful review, Gayle. My book club is considering it. What a wonderfully written review. You really captured the essence of this book. The prologue left me feeling so ashamed of what this country has done (and continues to do) to the indigenous people of North America. I agree about the ending but had not thought about it the way you did. It’s an interesting perspective. If you haven’t read Killers of the Flower Moon, you should. It’s a true story and it’s shocking. Thank you! I am glad you enjoyed it. Nicole loved Killers Of The Flower Moon – will check it out.